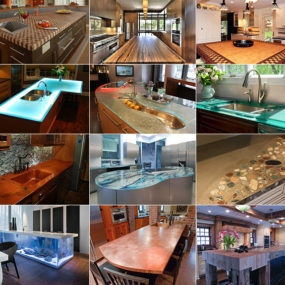 There are many different countertop materials on the market right now. 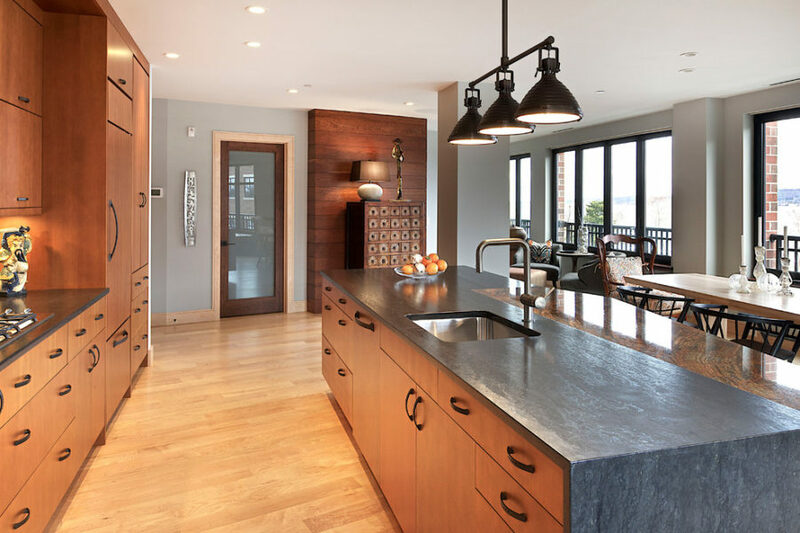 Granite, marble, and Corian are just a few of the more popular options. 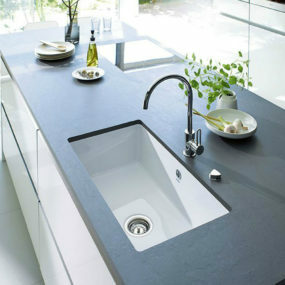 When choosing a countertop material it’s very important to consider not only its aesthetic but also its practicality. Wood, while durable, can deteriorate fast due to water exposure. Metal has both its advantages and downsides. 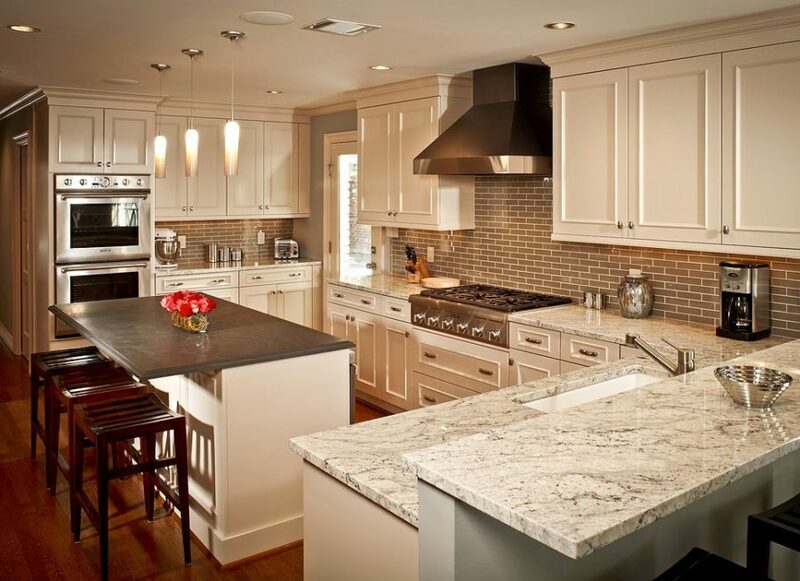 But stone is more of a traditional choice and often considered first when it comes to countertop design. 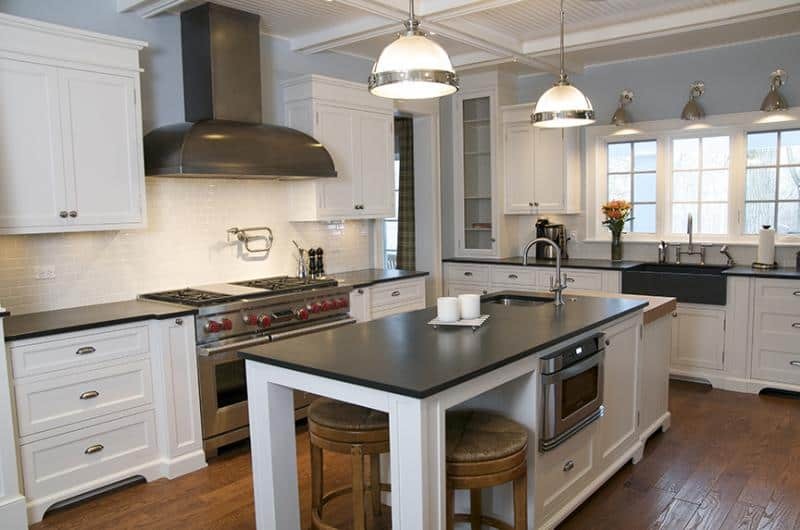 Slate countertops are a somewhat new trend right now, but are they any good? Natural stone has a certain flair to it that no other material can quite match. It’s beautiful, luxurious, and, of course, expensive. But slate is very different from all other stones. Used for roofing, siding, and flooring slate stone is a homogeneous metamorphic foliated rock that is composed of minerals like quartz and muscovite or illite and some others. Its first rise to popularity happened in 1870’s when slate tiles were used for roads and waterway systems. 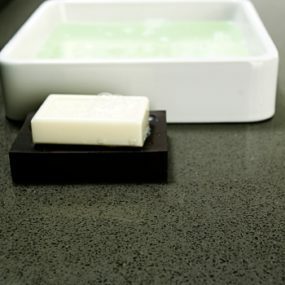 Slate’s low water absorption makes it incredibly durable and stain-resistant unlike most natural stones. Thanks to this, slate countertops require little to no maintenance. Because of its unique properties slate has been used to create laboratory bench tops, billiard tables, school blackboards, and even tombstones. Today, however, it is widely used for all kinds of finishing work. Slate comes in an array of subtle hues like black, grey, green, and purple. It offers a matte finish but can also be given a wet look if you’re after a glossy finish. 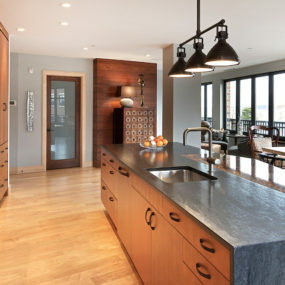 Slate may not be as popular as granite or marble, but it offers a very different aesthetic. 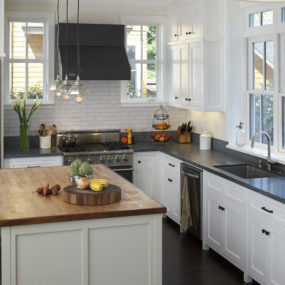 It looks smart and stylish and can really make an impact in a white kitchen. Grey slate has some semblance to soapstone. 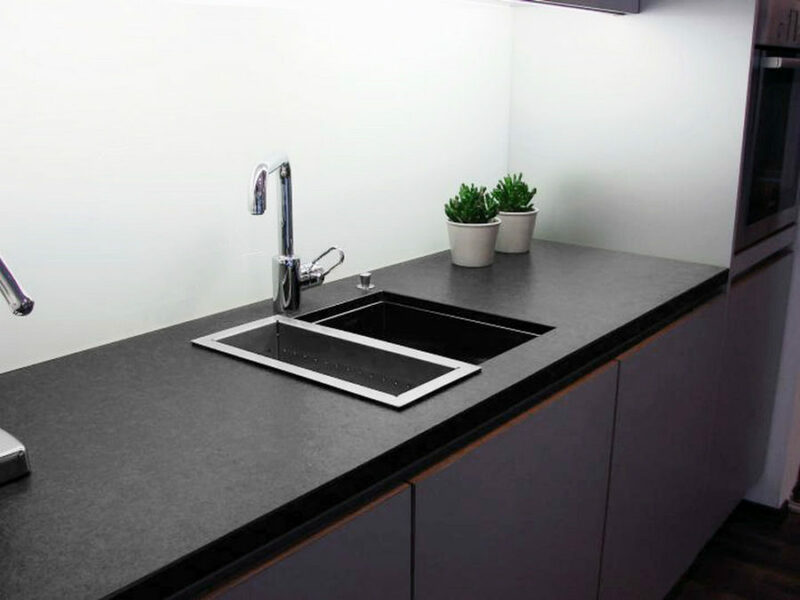 Since it’s waterproof, slate can be used to build a sink to match your countertop. 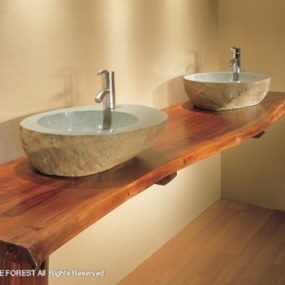 This is incredibly fitting for a farmhouse style sink. Slate is highly versatile and can be used in combination with other materials like granite, marble, and wood. 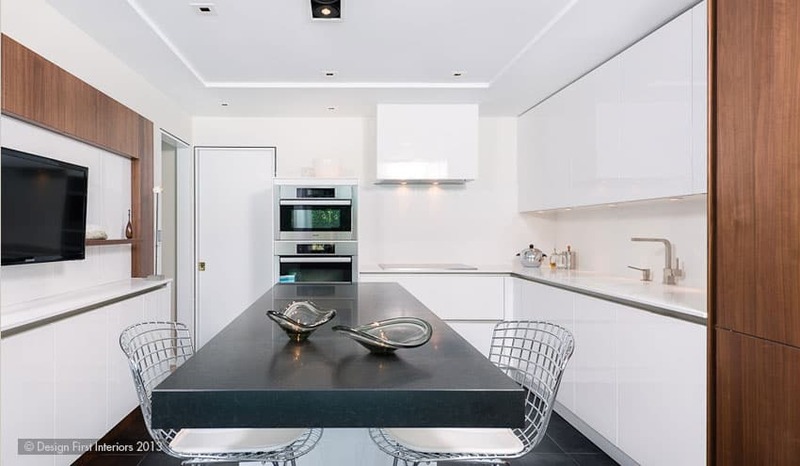 Say, you want your kitchen island to have a different countertop material or make a contrast between a black slate countertop and a white Corian one. 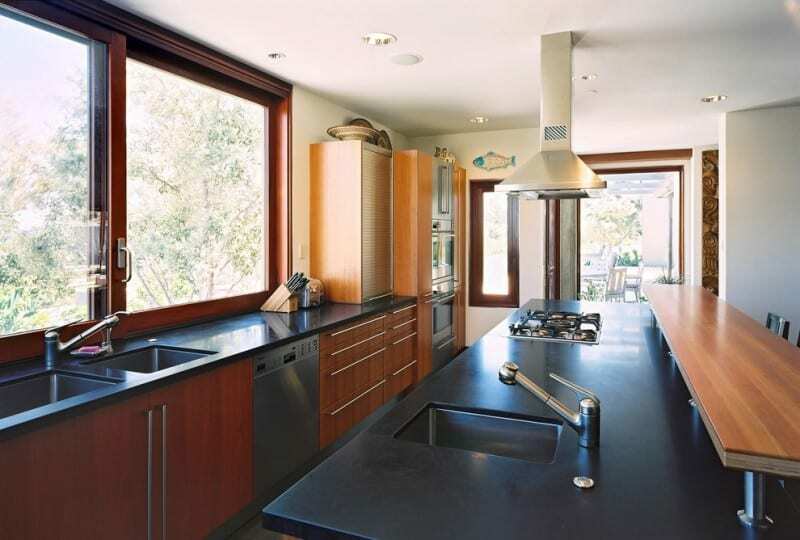 There are, really, a lot of design options and solutions when it comes to slate countertops. Thanks to its simplicity you can do a lot with it. Walnut Mill Valey by Camello Inc. 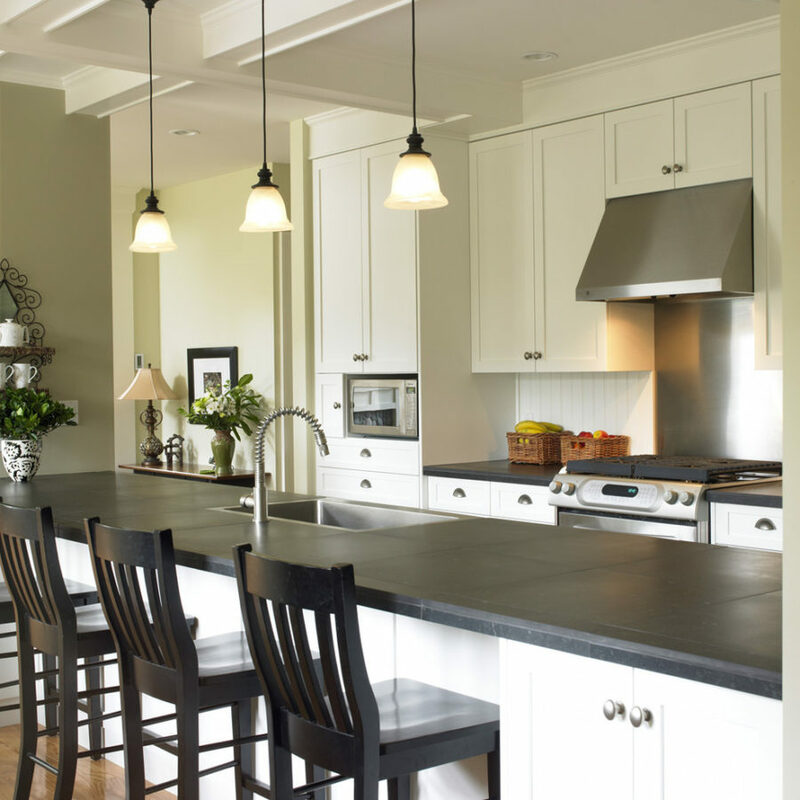 Slate is non-porous unlike a more popular soapstone, which makes it easy to clean. 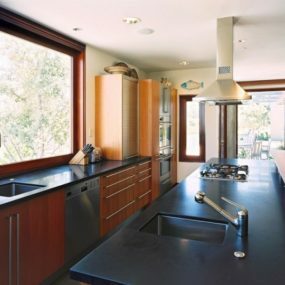 It doesn’t harbor as much bacteria and won’t let tomatoes leave stains on your countertop. 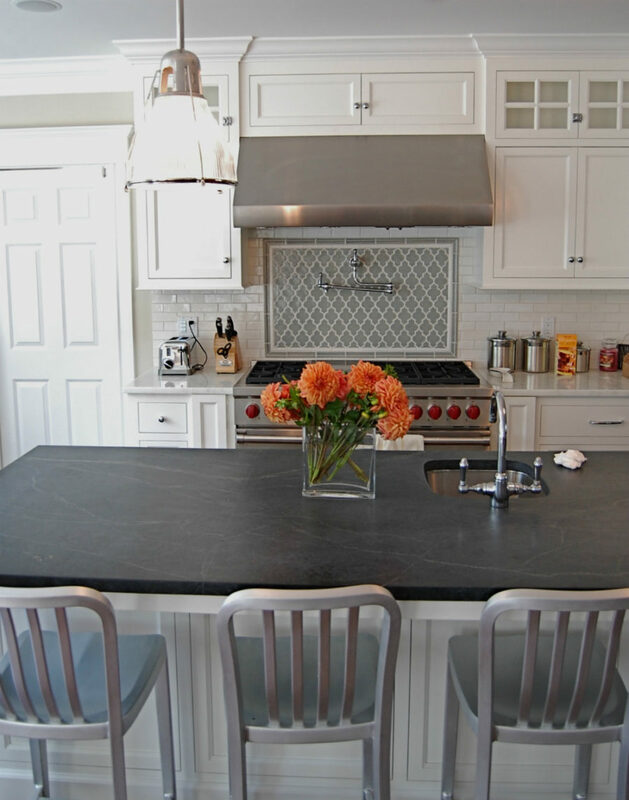 When it comes to cost, slate makes for a more affordable countertop material. At around $55 per square foot ($125-$150 for marble) it even beats concrete and crushed glass in terms of affordability. Slate is a strong material. It’s used exactly because it can withstand the outside conditions really well. With that said, some basic maintenance is still in order. 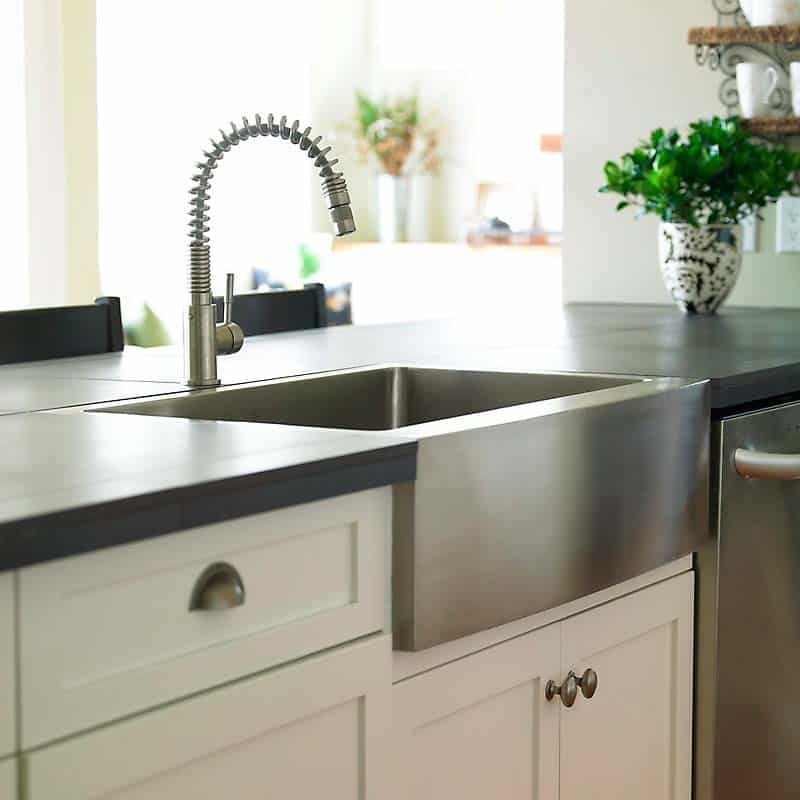 If you are installing a slate countertop on wooden cabinets, you’d want to keep it dry to prevent water causing wood to rot. Slate countertops do have a downside, though. 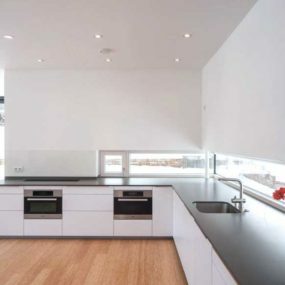 Since they are foliated the countertops may chip or flake at the edges and the edges themselves can be quite sharp. It is recommended to have the corners rounded out to avoid injury. And as for chipping and possible scratching, make sure your slate is high- quality and avoid putting sharp objects on your countertop. Buffing can help polish scratches away, if they do emerge. Wood and slate kitchen will have a certain look about it. While natural wood has a degree of warmth to it, slate is cold and dark. The contrast looks nice and slate adds a stylish vibe to simpler wood. 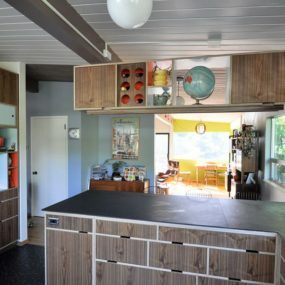 The black handles on these cabinets and the matching stool leather seats accentuate the dark countertops in the kitchen. 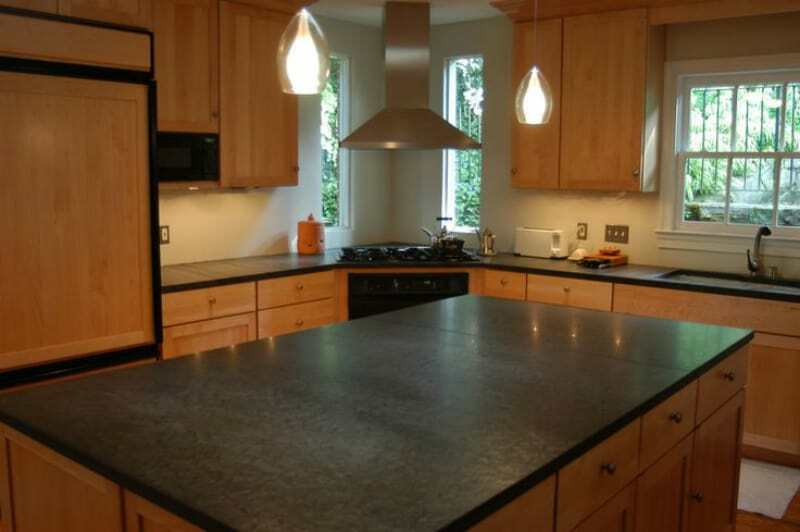 Blue-ish slate definitely makes this countertop stand out from all the others. 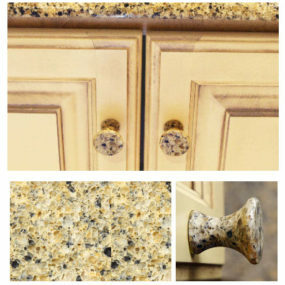 Even the traditional cabinet doesn’t look the same with this stone. 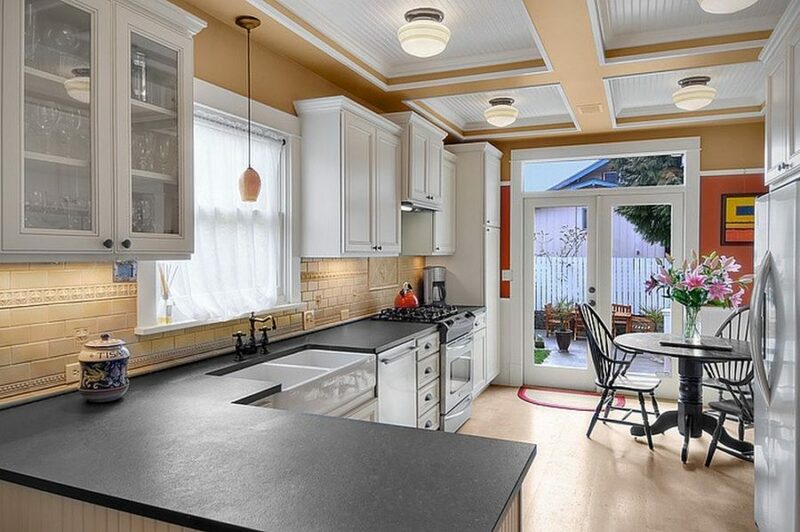 Here, the countertop is echoed by floor tiles and a multicolor slate stove alcove. The combination of cold blue and natural brown is like a breath of fresh air. 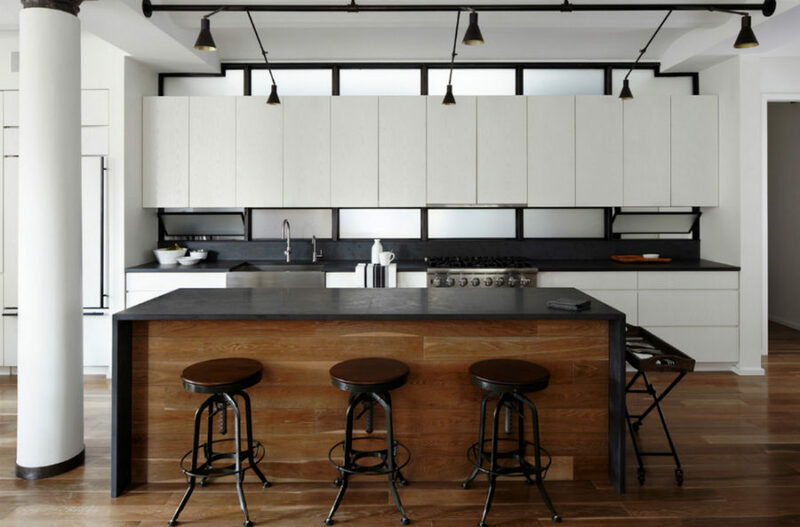 In this modern kitchen natural wood, slate and white color are sharing the stage. A combination of a wooden base and a slate countertop looks as good as the classic pair of black and white, which is also here. Black accent lights and cabinet frames make a nice background for the prominent but minimal white cabinets while the wooden floors echo blend with the kitchen island. When it comes to styles slate is as versatile. 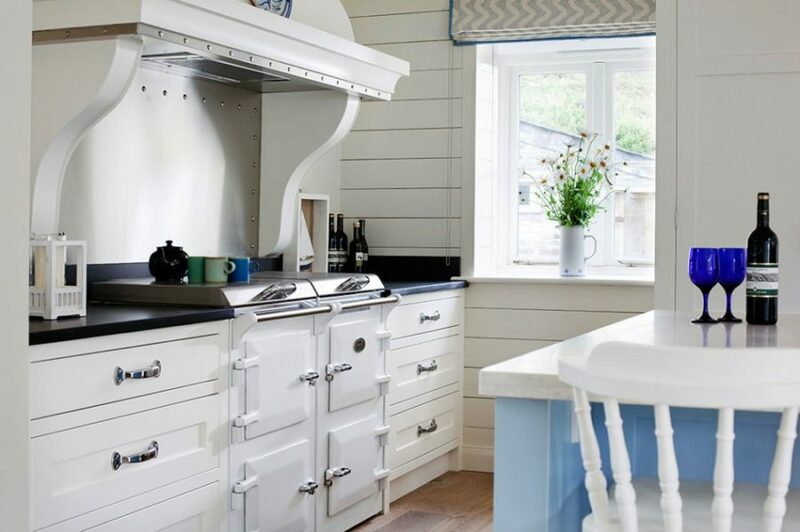 From cottage style to modern minimalism to traditional luxury it can work just as well. Thinner slabs look great in more traditional designs. 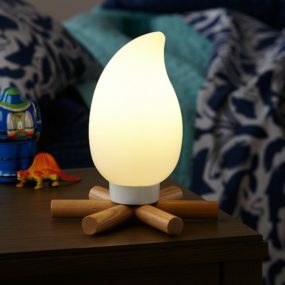 With modern style, however, you can really play with different materials. A slate countertop may be understated, but put it in the right interior and it will attract attention. 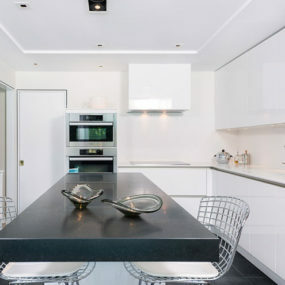 This white minimalist kitchen is using a thick slate countertop as its focal point. 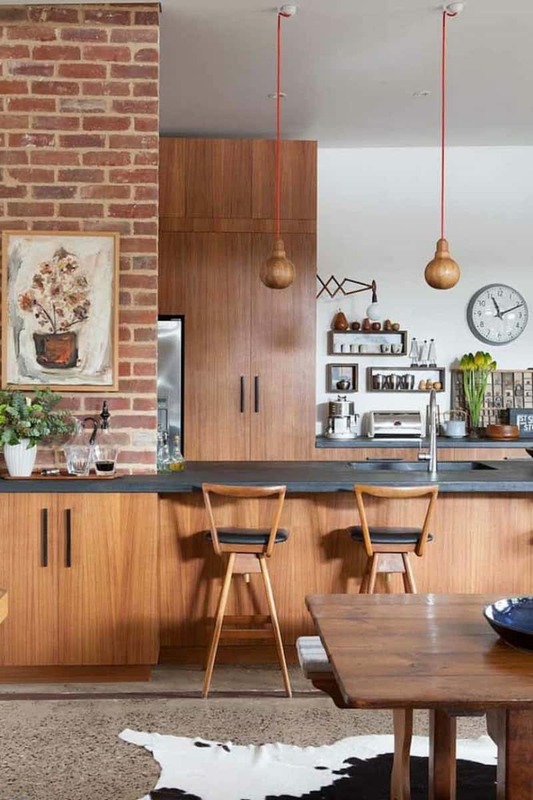 Wooden accents make the kitchen more inviting. The rest of the countertops are kept white and minimal while slate tile floors echo the massive kitchen island countertop. 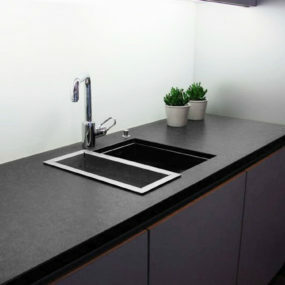 Ultra thin slate countertop is also an option. 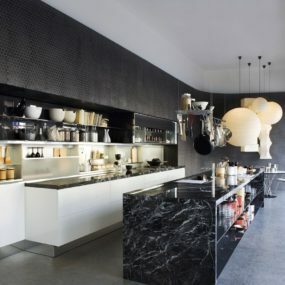 In this kitchen it is purely practical, it seems, but it offers a different aesthetic than the more popular stones would. This looks like a very practical solution anyway. 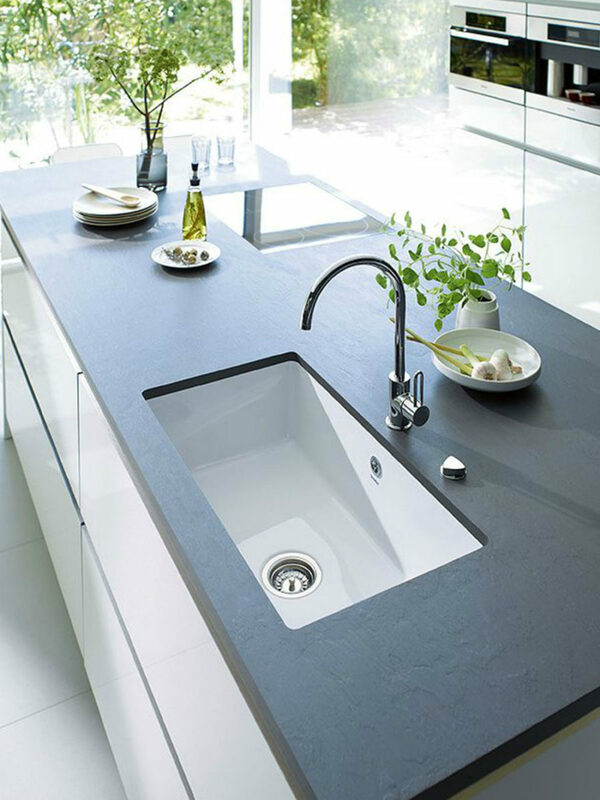 However thin a slate countertop maybe, it will still protect your surfaces thanks to its non-porous structure. 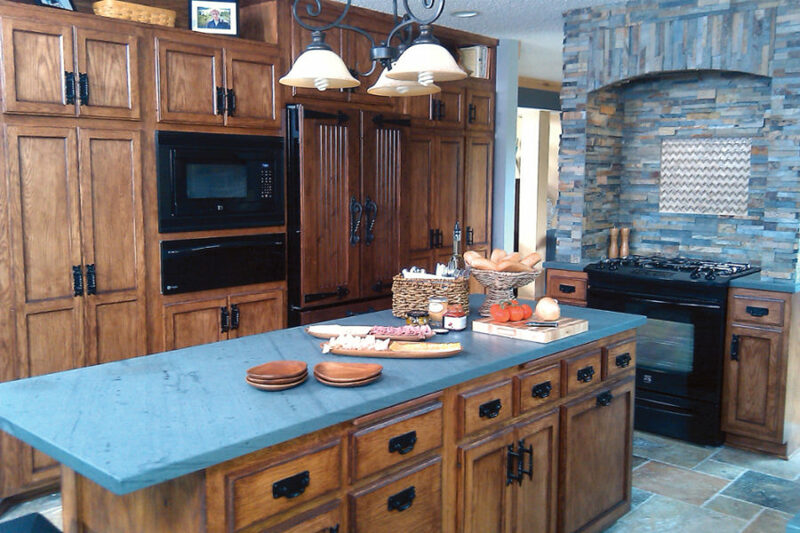 This is another example of a plain wooden kitchen getting a style upgrade with a slate countertop. The black stove and microwave make for appropriate accents. Even the uniformity of the cabinets doesn’t look as bad when it’s broken up with some dark stone inclusions. 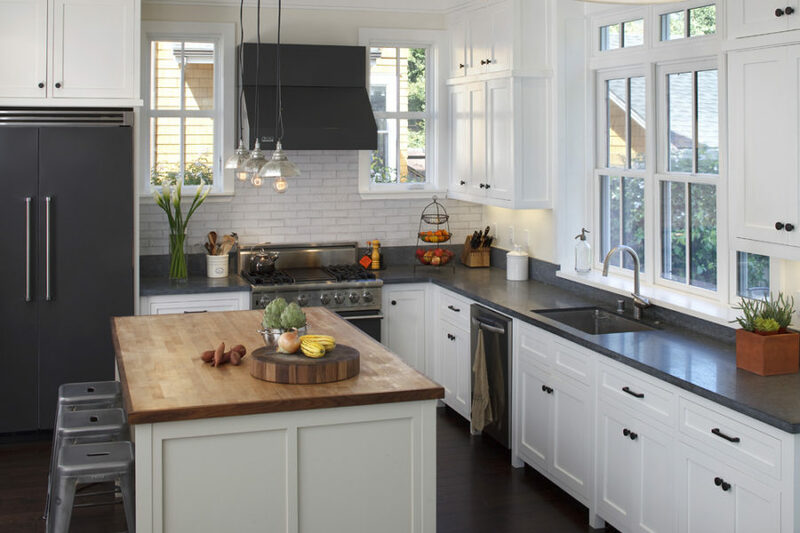 In a white kitchen black slate makes all the difference. A room instantly gains a modern aesthetic. 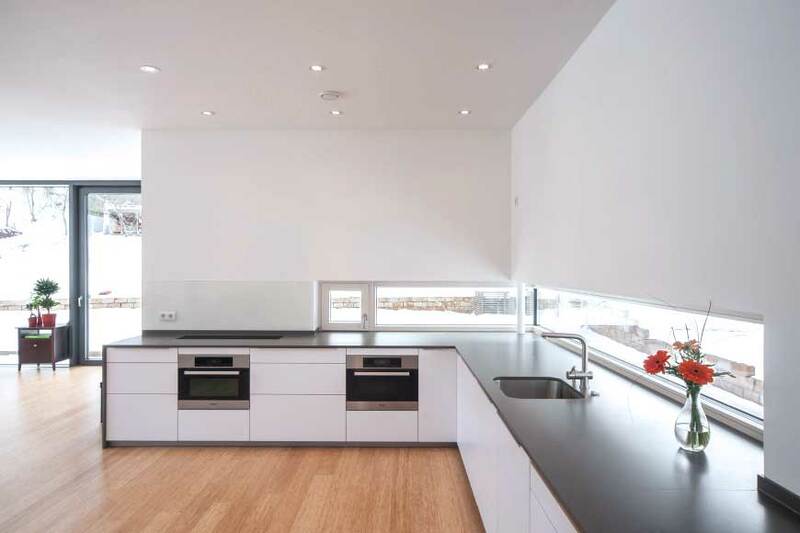 Here, the polished countertop goes well with the minimalist cabinets. The surface looks seamless as if it was made out of a whole slab. 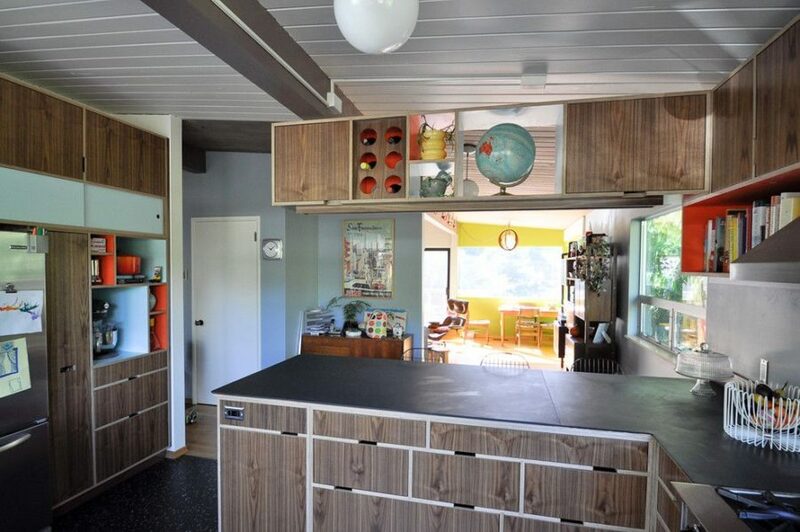 It would look equally interesting if the cabinets were a matching black color. 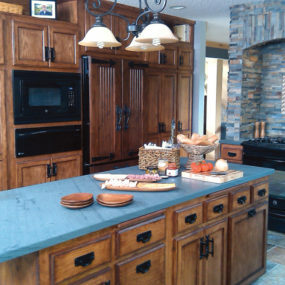 Another wood and slate combination here has a spacious kitchen island accommodating both the sink and cooking stove. The wooden bar counter is built right into it but elevated on metal legs. 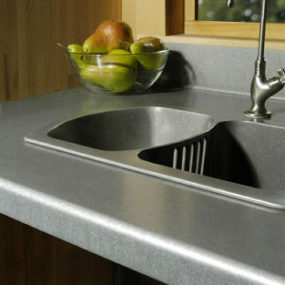 Another great thing about slate is that your kitchen technology doesn’t stand out as much as with fancier countertops. Here the slate countertop again makes a focus of the interior. White cabinets and metallic accents make the bulk of it. 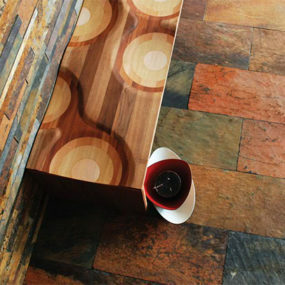 The latter create a very different feel than would natural wood. Even though this is quite a mix of traditional and modern styles the kitchen has a touch of industrial chic to it. Even traditional kitchens can make use of slate. Here a black dining set smartly marries the countertops with the rest of the design. This interesting combination of colors (beige, sand yellow, coral red) is possible thanks to black and white that make up the base of the color scheme. Here, the grey slate countertop creates a subtle contrast with the cream cabinets and a countertop in a different stone. There is, of course, a more practical design solution as well. Swapping these would make the more durable material (slate) exposed to water and food, whereas a more expensive stone would be become a focal point and a design element of the room. 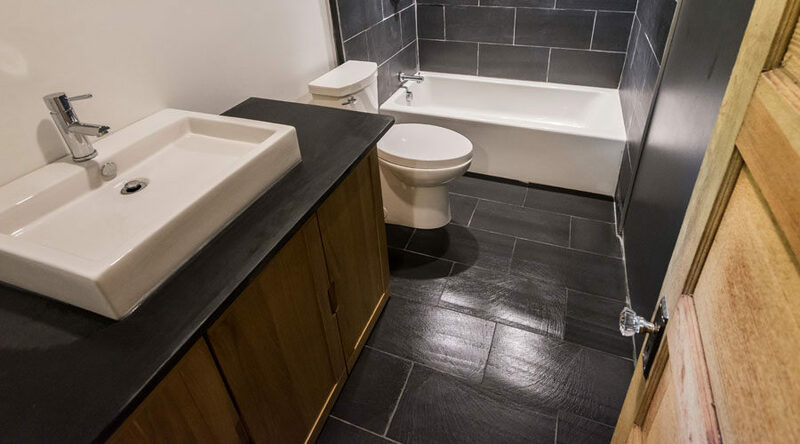 Slate can also make modern and practical bathroom countertops. If you’re after a minimalist masculine aesthetic it is a perfect choice. 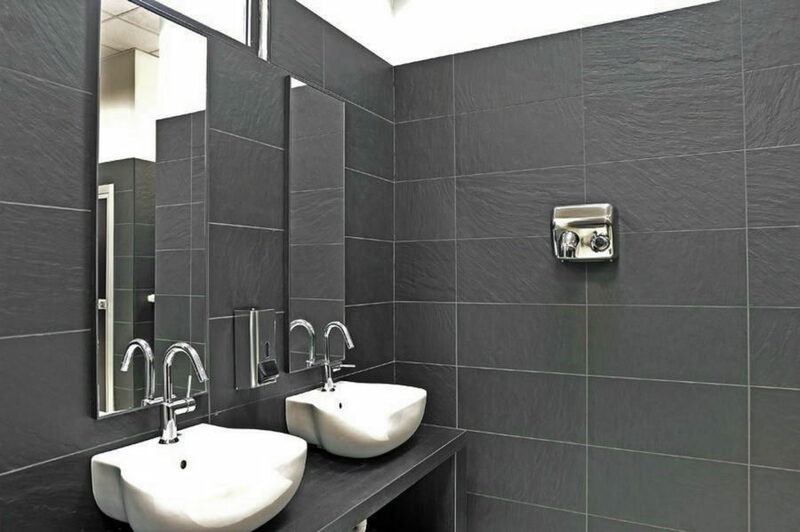 Walls and floors can also be covered with slate tiles for a uniform monochromatic look. Slate tiles usually have a beautiful texture to them that gives a minimalist room some dimension and a subtle detail. Black slate and natural wood again make a great combination. 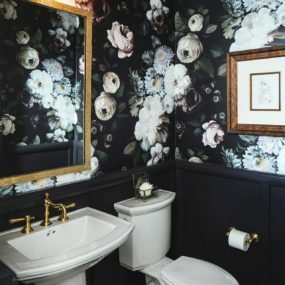 White bathroom plumbing adds even a starker contrast. Combination of textures creates a lot of room for creativity. Slate is a great natural stone without the usual attributes like steep cost and high maintenance. It is versatile and can be used beyond kitchen and bathroom. Its aesthetic is simple and yet elegant and modern and there is a choice of texture and color albeit somewhat limited. 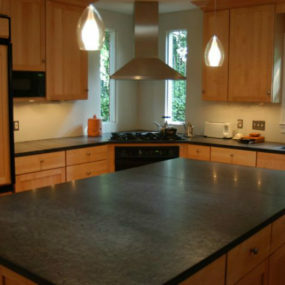 If you’re looking for an affordable, stylish countertop material you can consider slate as a viable option.